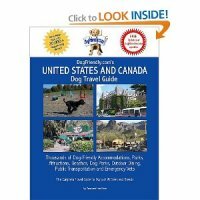 Planning to travel with dogs? Here's information to make it fun and hassle-free for everyone! If you plan to travel with dogs, you will find it a lot easier today than in the past. Dogs can fly the friendly skies or hop in the car for a road trip now that the welcome mat has been rolled out for them at many hotels, restaurants, pet parks and beaches. In the past it was just too much of a hassle to consider taking your dog along. But now that's all changed, and dog lovers are rejoicing because taking your pets along has become downright respectable. In fact, when you travel with dogs, you'll find even upscale hotels and resorts falling all over themselves to get your business with all manner of special services just for your pooch! Dogs are now getting the recognition they deserve, so you won't have to sneak them in the back door under cover of darkness anymore! Tip: If you're planning a trip by car, be sure to read all the helpful tips we've included on this page. When you travel with dogs, pet friendly accommodations are the way to go to make sure your dog's needs will be met. For your convenience, a reservation form is provided below so you can book ahead at hotels that welcome pets around the US and around the world. Give it a try the next time you are planning to travel with your dog to make this part of your trip hassle-free. When you use the form, you'll get a chance to look over a choice of accommodations within your destination cities or states so you can choose the hotels with the amenities you desire. Best Western Dog Friendly Location and Reservation Form. Best Western has over 1900 locations that are pet friendly! Tip - It is always a good idea when making a reservation to double check that all the amenities you are seeking for your dog, are still available. After all, it is his vacation too! Also, once your plans have been made, be sure to take a look at our Pet Travel Checklist. This helpful list has pet travel tips to help prepare your dog for the trip, as well as a "what to pack" guide so that nothing is overlooked when you pack for the dog. Here are some of the services quite frequently being offered by hotels for your dog's pleasure. Of course, you won't find all of these services at every pet friendly hotel and some may be on the expensive side. However, you will find many good places to stay that are very affordable. Complimentary bottled water and dog bowls, healthy baked treats, rawhide chews, toys etc. In addition to all of these amenities, When you stay at a dog friendly hotel, the staff are generally more pet oriented and your dog is sure to get some enjoyable attention during your stay. When you are out and about on your vacation, you'll also find many restaurants that welcome your dog, even providing a special menu just for him. It's pretty easy to find them through local directories or the Chambers of Commerce. And, if your dog is a real social canine, many cities have now developed local dog parks where families can gather with their pets for a bow-wow. In addition, many coastal communities have set up designated beaches where hounds can romp to their heart's delight in the sand. Small Dog Carriers... don't leave home without them! Life Jacket For Dogs...when traveling by boat.